The miracle at Cana was a miracle of provision. A miracle of abundance. 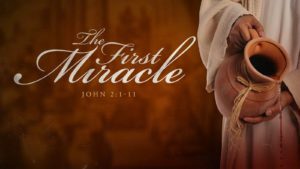 A miracle of faith. If we trust in God’s miracles, we will find that he can turn our fears into trust, our weaknesses into strengths, our pain into power, our hate into love, our tragedies into triumphs, and our hurt into hope. We need only have faith.